Jolie Kerr is a cleaning expert and advice columnist. She’ll be here every week helping to answer your filthiest questions. Are you dirty? Check the Squalor Archive for assistance. Are you still dirty? Email her. Last week a ping on my phone indicated that the ladies of Jezebel were requesting my presence in their Slack channel. They had a question for me. A laundry question. That was all! I mean, it’s a good and entirely legitimate question, but I guess I’ve just been doing this job so long that I expect every query to incorporate some sort of combination of disastrous and esoteric. As much fun as the disastrous and esoteric questions are for me to answer, there’s a lot to be said for covering some fundamentals. So that’s what I’m gonna do. I’m enrolling you all in Laundry School. To kick things off and get us all into the spirit of things, I selected a few topics to start with. Next week, and possibly the week after, depending on how many questions you have, we’ll go a little deeper into the weeds. What’s the difference between liquid and powder detergents? Powdered detergents have a longer shelf life than liquids. That makes powdered detergent ideal for those buying in bulk as, over time, the laundering power of a powdered detergent isn’t going to diminish. They also generally involve less packaging. The advantages of a liquid detergent include, as you’ve likely sussed out by now, that it dissolves thoroughly in the wash, regardless of what water temperature you’re using. Liquid laundry detergents can also double as a stain-pretreatment product, which is a nice bonus. On the con side of things, liquid detergents use more packaging and therefore create more waste, and the measuring-cup lid design promotes detergent overdosing. I’ve talked before about why using too much detergent is a bad thing, but the gist of it is this: The use of too much detergent will leave soap residue in your clothes, which can lead to a mildew-like smell and, in certain fabrics, cause fibers to break down. What are laundry boosters and stain pretreatments, and do I need them? In my weekly Ask a Clean Person columns, I talk a lot about laundry boosters and stain pretreatment products—those are things like Borax and bluing and OxiClean, Shout and Lestoil and Zout. But let me take this opportunity to actually define those things for you! A laundry booster is a product that is used in concert with laundry detergent, in the washing machine, to add extra stain-removing, whitening/brightening, and/or odor eliminating power to your wash. Laundry boosters can (and should!) also be used as a soaking agent to eliminate staining or dinginess prior to laundering. Laundry pretreatment products, which tend to come in either spray or stick form, are meant to be used on stained items prior to going into the wash. While I strongly encourage the use of boosters, when it comes to the pretreatment products, I’m going to basically insist that you have one. Is there a right way to separate the wash? There are two primary ways to think about separating laundry: by color and by fabric. Depending on how much laundry you do, you may separate by both! You’re probably familiar with the notion of separating by color, so this will be fast. The idea is to wash whites, or lights, together, and darks, or colors, together. This allows you to choose a water temperature, detergent, and booster that are most appropriate for one versus the other, and helps to prevent color transfer problems. The idea of separating the wash by fabric type may be a newer concept to some of you, but the idea is equally as straightforward as separating by color. Heavy-duty items like jeans and sweatshirts (which pummel fine cottons and other more delicate fabrics) and towels and fleece (which can transfer lint onto fibers like Spandex) are best washed on their own. If you only do one or two loads of laundry at a time, getting super detailed with separating by fabric type probably won’t make a lot of sense for you, in which case you should feel free to stick with separating by color. How do I know what water temperature to use? If you’ve been reading your io9—which you should be doing every day, because, io9 is a damned delight—you’re probably familiar with the argument that you should wash your clothes, regardless of color or fabric type, using cold water. And listen, you’re not gonna catch me arguing with io9. I do, however, think there are nuances, and so I’m not going to holler at you if you’re still using hot water in certain laundering situations. So here’s the old rule of thumb for knowing what water temperature to go with: cold water for darks, and hot or warm water for lights. It’s also crucial that you take fabric type into account, as certain fibers like wool or cashmere, regardless of color, should never be washed in hot or warm water. The use of warm or hot water is also recommended when you’re talking about laundering heavily soiled items. How do I decode the different dryer cycles? Now then, I know that you think I’ve gone and forgotten what set this all off, and I want to assure you that I have not! We have now arrived at the part of the post where I tell you what “permanent press” means. It must be noted, before I explain what some common dryer settings entail, that not all machines are created equally and may employ different terms to describe the settings available to you. But these are the biggies. Tumble dry. A no-heat dry cycle. Ideal for delicates or items that are prone to shrinking, or for clothing with embellishments that may melt or warp due to exposure to heat. Delicate or low-heat dry. Use this setting for items with Spandex or other forms of elastic, as well as for delicate cottons and wools. Permanent press: A medium-heat drying cycle with a cool-down period at the end designed to reduce wrinkling. Regular: The highest heat setting, best reserved for heavier items like jeans, sweatshirts, and towels. Okay! Are you excited? I know I’m excited! 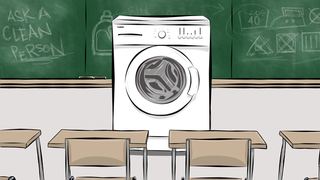 Please ask away, either in the comments or by email using the subject line LAUNDRY SCHOOL, and I’ll get to as many of your questions as I can over the next few weeks.